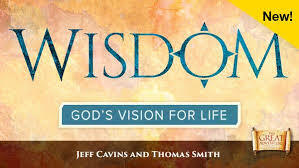 WISDOM – God’s Vision for Life by Jeff Cavins and Thomas Smith examine biblical wisdom as it relates to daily life. Scripture and the Tradition of the Catholic Church provide an abundance of wisdom, though it can often be challenging to apply it to our lives. Drawing on the wisdom literature of the Bible—Proverbs, Wisdom, Sirach, and Ecclesiastes—Wisdom will teach you how to actively seek out sound guidance and increase your sense of peace in navigating life. In everything from friendships to finances, from making decisions to attaining peace of mind, Scripture offers a vision for happiness and well-being. With this program, you will learn how to gather, gain, and grow in wisdom, and you will experience the joy it brings to your life. To register for Wisdom, please click here, or you may print a copy of the registration form (Monday evening, Thursday morning) and return to the Parish Office. Mar. 7, Wisdom for Peace of Mind, Proverbs, Sirach, Wisdom, Phil. June 3, Wisdom for Peace of Mind, Proverbs, Sirach, Wisdom, Phil.